What is the Christian Leadership Training program? Christian Leadership training is a program that progressively builds your knowledge and relationship as a follower of Jesus Christ and your skills as a Christian Leader in all areas of your life. The goal of this program is to Train students to be fully committed followers of Christ who will embrace their call to share the Gospel, train others and care for orphans. Why should I do Christian Leadership training? People who participate in this training want to go “all-in” with their relationship with Christ by learning more about God, their faith and how it applies to their daily lives. This training is an investment in yourself, your future and in the lives of others. Our three purposes are to Spread the Gospel, Train Leaders, and Care for Orphans. We must know the Gospel in order to teach others and be leaders who can stand firm in their faith, in all circumstances—and that means knowing more than the basic outline. This program will strengthen you in a way that demonstrates an alternative to the way of life that common culture is so strongly trying to persuade you is the only option. Does this get me into leadership? This training program is not leadership training specifically designed for trips with Y4O. It is training for everyone with the purpose of strengthening the body of Christ in our communities, schools and abroad. When you participate in training such as the Christian Leadership Training program, you are investing in being the best leader you can be and it is an outward sign to the rest of the world that you are someone who follows Christ and are worthy of being an example to those finding their way. This type of commitment to personal growth equips you for leading and serving in all areas of your life and puts you at an advantage to secure a leadership role in Y4O. Leadership roles are very limited this year and being a previous leader will not secure you a spot. 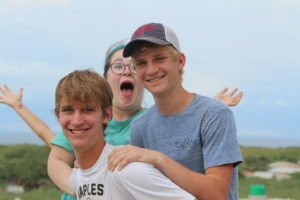 We expect that some people will want to participate in Christian Leadership training that have no intent of applying for a leadership position with Y4O, they simply want to become strong leaders. What makes this better than a Bible study? If you make a commitment to participate in Christian Leadership Training, we will commit our time and resources to you. As a participant you will have a personal mentor who will work one-on-one with you throughout your study. You are at a unique place in your Christian walk and your mentor will be your guide and accountability partner. By getting to know you through the training questions and individual conversations, your mentor will be able to customize the training discussions to meet your specific needs. The two of you will work together to set a schedule of meetings to complement both of your busy schedules. and anxiety you can withstand circumstances you never thought possible. And, only because of your new strength that will be deeply rooted in the promises of the Bible. This type of training will create in you the type of faith that is transformative and all those who meet you will see that there is something significantly different about you. You will never make a more valuable investment in your future, your faith, your relationship with Christ, your leadership abilities and yes, your eternity. You will then be grounded to share your faith more confidently and will have more of an understanding of why we do what we do through Y4O. Your participation will also open opportunities for you to join other events including online group discussions, in-person fellowship, and retreats. The training is set up as one training session per week but can be customized to fit your needs. You will have the opportunity to “go at your own pace” but, we recommend trying to keep a schedule at first to create a healthy habit of spending time with God each day. Much like training in sports and music, the more consistent you are the more your skills improve. Each week the trainings will consist of two parts- individual training and mentorship meetings. Individual trainings can be done at any time of the day on your own time and include an online element. Most of the weekly sessions will take a time commitment of one hour per week of individual training and thirty minutes of mentorship time. You can always dig deeper and spend more time studying a specific topic. Y4O will assign you a mentor and will do their best to keep genders the same. You and your mentor will create a mutually acceptable schedule to make sure your experience with this training is successful. We are excited to announce that enrollment is now open for our new program, CL4U – Christian Leadership Training. If you are a high school freshman or older, we are inviting you to join us in the launch of this personalized Christian Leadership training program. Through this experience, our participants will not only strengthen their relationship with Christ by developing their knowledge of the Gospel and the Bible, but will also acquire critical leadership capabilities. This unique online opportunity is open to everyone, regardless of location. After enrollment, each participant will be assigned a personal trained mentor, who will meet with you weekly. This 4 year one-on-one mentor guided program runs in modules of 4-10 weeks each and progressively deepens your Biblical knowledge and leadership skills each year. It is our hope that each graduate of the CL4U- Christian Leadership Training will be equipped to lead a life of purpose and significance, making a difference in our world. For more information about CL4U- Christian Leadership Training, please contact Terry Hand at terry@youth4orphans.org or (239) 248-2838. We hope you will pray and consider this great opportunity. We hope you will pray and consider this great opportunity. For more information on our Christian Leadership Training, please contact Terry Hand at terry@youth4orphans.org or (239) 248-2838.